Make your dinner a real hit with the perfect combination of steaks and burgers. 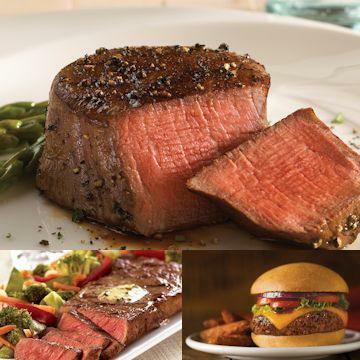 The Grill Mates Combo includes our superb Filet Mignons, unbeatable Boneless Strips and supreme Gourmet Burgers. It's the ultimate combination for the grilling enthusiast. See Steak Cooking Chart.�Steaks Beef, Pork, Lamb, Veal and Poultry have been born, raised and harvested in the USA. Grill or Broil: Thaw burgers. Grill or broil for 5-6 minutes per side until internal temperature reads 160�F. Overcooking can result in a dry product.�Contact Grill: Grill for a total of 5-6 minutes until internal temperature reaches 160�F. It's easiest to remove burgers from the wrap while still frozen!�Pan Fry: Preheat a small amount of cooking oil in non-stick pan over medium heat. Add burgers, pan frying for 6-8 minutes on each side or until internal temperature reaches 160�F.